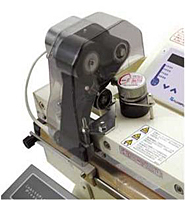 The hot stamping machine printer is available as an inside device (FEP-N1), and as an outside device (FEP-OS-N1). It is a two-line hot printer, with one-line capabilities. The FEP hot stamping machine allows for printing to be done while sealing. The electronic heating element on this type of plastic sealing equipment reduces the warm-up period and cuts energy consumption, making this an economical printer. FEP-N1 model offers two-line printing for inside use. The FEP-OS-N1 offers two-line printing for outside. And the FEP-V-N1 offers two-line printing device for outside. The printable packaging materials for such packing machine models are: KOP, NY/PE, PE, paper, etc. The electronic heating element reduces the warm-up period and cuts energy consumption, making this an economical printer. *1: The type may not print well on some films (e.g., OP and CP). The text can be changed by replacing type. Printed information such as the product date, serial number, and weight, can be changed by replacing type. The types are print primers that were modified for use with our printers. They are made of zinc alloy. FEP-N1 is a printer that prints inside the seal. FEP-OS-N1 and FEP-V-N1 are printers that print outside the seal. FEP-OS-N1 cannot be installed on a double heater sealer, OPL or FA size 200. FEP-OS is an outside printing device: Printing is done outside the seal. Printing is done without ink, by using heated type to print the carbon from the print tape. Two-line print: about 6,000 letters.